Historical accounts suggest that this portage linking Lake Simcoe and Lake Ontario was a major line of communication used frequently by Indians, so that a clear, open trail existed. This was the trail that the first white man, Etienne Brule, saw the Toronto area from in 1615, and later on used by other travellers making it a route of historical importance. "This was no ordinary trail; it was a main thoroughfare, a trunk line of communication with distant regions... The Carrying Place possessed a permanence very different from casual paths through the forest. It was as old as human life in America." Several Indian villages are shown along the portage, the largest being Teiaiagon, some accounts saying that about 2000 Iroquois Senecas lived there before the French evicted them in 1687 (the Iroquois were at war with the French and would only sell furs to the Dutch and English in the New York area). By the 1700s, Mississauguas friendly to trading furs with the French migrated in, and established a village in the same general area. Furs and pelts from areas north of Toronto would have been channeled through the portage during the days of the fur trade. The Nine Mile Portage Heritage Trail, Barrie. 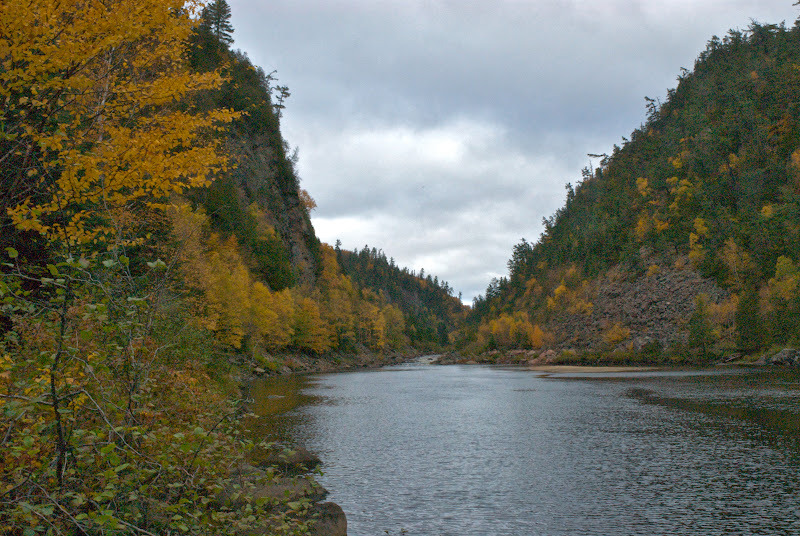 By the way, it is now believed that Brule ascended the Grand River, rather than the Humber. I was near Hwy 400 and Hwy 9 this weekend and stumbled across a couple of historical plaques explaining the importance of this portage. Four photos are included below. The precise location of these plaques is 44.026339, -79.608491. (They're on the north side of Hwy 9 - Actually on S. Canal Bank Road - 1.17 km west of where Hwy 400 passes under Hwy 9.) They're just a bit east of the Highway 9 Farmers Market. John Graves Simcoe's journey up the Toronto Portage resulted in a return down an easier route along the Rouge river... the account is out there somewhere but the links no longer work. And an artist's rendering of the Toronto Portage, seems misleading since the portage is on the wrong side of the Humber. However, there may have been river crossings to make the travel easier. There also wasn't any large waterfall in the area so maybe artistic license. I would not surprise me if there was a waterfall once. The Credit, Humber and Don and Rouge were much different rivers back in the day. On the old topo maps that I used to have on the Credit there was a falls marked just about where the CP tracks are now at the south end of Streetsville. That was filled in with river gunk when they built the mill dam where Barbertown road is now. Amy evidence of a falls was destroyed when they put the trunk sewer down the middle of the river there. The easy to break shale into bricks and foundations would have been a very easy resource for the early immigrants to extract, especially at low levels. There is only one small section of 16 Mile creek between Nayagawa and Dundas that shows what the original watersheds where like. The Wikipedia entry for the Toronto Carrying Place suggests that it crossed the Humber River further upstream and branched, so perhaps the artist rendering is from near Kleinburg. It forked at Woodbridge, with one path crossing the east branch of the Humber and running along the west side of the river to the vicinity of Kleinburg, where it crossed the river again. That was one long portage! JJ, you might be right that there was a waterfall on the Humber next to the portage... the painting depicts LaSalle's journey in 1680. 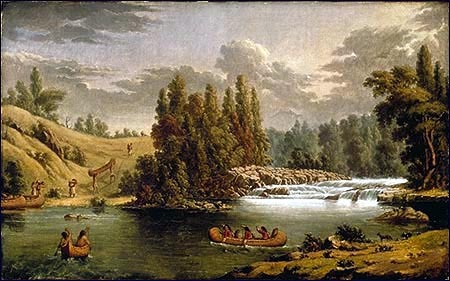 I might be wrong, but LaSalle was travelling downstream on the portage to avoid Iroquois on Lake Ontario, on his way from Georgian bay to the Mississippi... maybe another error in the painting. Never mind, back to the waterfall... John Graves Simcoe had the first mill built at the site of the Old Mill at Bloor and Humber in 1793... if there was a waterfall there it might have been easier to divert water to power the sawmill. OTOH, the rivers in the area are said to have been narrower in pre-contact times than they are today. After logging and agriculture stripped stream banks of vegetation, erosion widened the rivers with no vegetation there to offer streambank protection. Narrower undisturbed rivers would have been easier to build diversion weirs on and there were hundreds of mills and dams built in Toronto area streams by the mid-1800s. I've been to the area many times and haven't seen any signs of a steep drop there that would have created a waterfall. But as you said, maybe that was taken out by stone removal. Also no records of Atlantic salmon jumping at the falls during upstream migration... or natives catching them by spearing at any falls. There is a book on the history of the Humber somewhere, maybe worth a look. I left out the credits for the painting... I wasn't going to include it at first since it seemed unnatural in the representation... the streambank forest cover looks very sparse and inaccurate, and the waterfalls doesn't look like something that would have been on the Humber naturally. GA Reid may not have been basing his painting on any historically accurate sketch but who knows. Here's another page on another historical plaque about the Toronto Portage, this one in Weston and older. Brad, I remember seeing that reference to the port crossing the river as well... there were also references elsewhere to swampy and marshy sections making the going difficult, which may have been the reason for the crossing in order to get to easier landscape to portage through. There are 8 weirs on the Humber, some of them quite large. I wonder if their cumulative impacts inundated upstream falls. Perhaps, some weirs were built over top existing rapids & falls. The artist may have embellished their size. In the mid 70's it was completely destroyed when they put the trunk sewer down the middle of the river. And yes the Credit even then was a much narrower river with many similar ledges and drops. 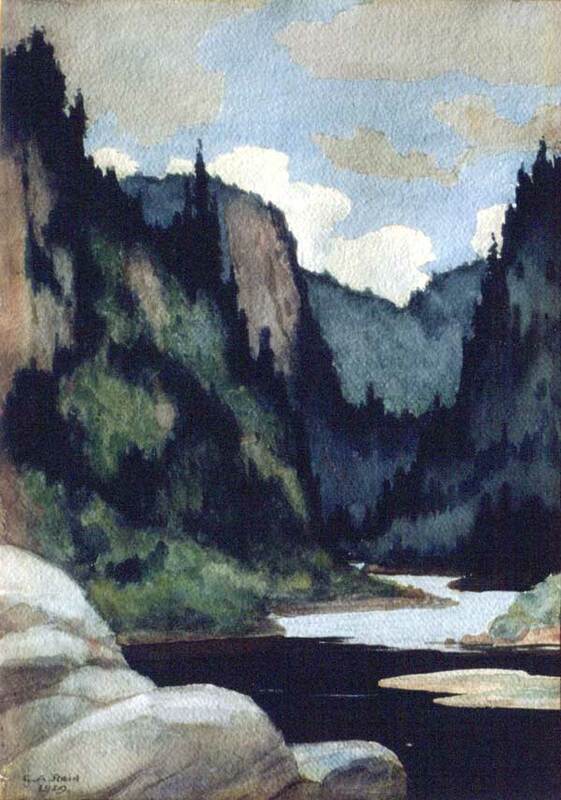 Artists have been known to embellish the size of things and I have seen some of George Agnew Reids paintings of Agawa Canyon and I can confirm this, but it was still very easy to match the locations in the Canyon. The Credit between Streetsville and the lake use to be a wonderful all season river and I imagine that the Humber suffered much more of that fate since it was urbanized much earlier. and my pic from a similar location in the Canyon it can give you an idea of what he changed. The cliff matches but the river is narrower, but the rapid has been narrowed by the rail way since he painted here. But I have noticed with both the Group of Seven and other artists that there are slight changes to make the paintings work. Yes, the Group of Seven artists' subjective interpretations often made paintings more effective... Tom Thomson's Jack Pine for instance shows the background hills on Grand lake being higher and more dramatic. Paul Kane's may also have been for effect rather than accuracy... here's another rapids and port scene, it seems a little too smooth and polished to be real, and a photograph may have shown gritty details that wouldn't have been so pleasing to gallery viewers. I've borrowed a book - WALKING INTO WILDERNESS: THE TORONTO CARRYING PLACE AND NINE MILE PORTAGE which has the Toronto portage painting on the cover and it may have some descriptions worth adding here. Although a quick scan through shows that there isn't that much on the actual portage itself and much of the text deals with bigger-picture history. Something that's changed for sure since the fur trade is the level of Lake Ontario relative to the Humber river... the lake level is constantly rising and submerging the river mouth deeper with each passing century. The east end of Lake Ontario is rising faster than the western end as a result of glacial rebound, the land and lake basin tilting up after the weight of glacial ice stopped depressing the earth's crust. The east end bedrock rises and creates a gradual damming effect increasing the lake level. This amounts to an increase of very roughly a foot a century, with water levels below the last rapids on the Humber maybe being several feet lower several centuries ago. The north side of Georgian Bay is also rising at about the same relative rate resulting in a drop of water levels there with time and it's possible to find raised beaches some distance inland, previously submerged and now isolated from the shoreline. Using the very rough foot-per-century bedrock rise rate, an old beach with wave-washed rounded cobble and pebbles can be aged. An inland beach ten feet above the current lake level means it might be about a thousand years old. ... reading about Georgian Bay and the Toronto Portage at the moment, both at the same time, great stuff. About halfway through the Toronto portage book last night... it's a pageturner. There isn't much about the actual portage so far, but the background history and setting in the Great Lakes is interesting. Champlain, Brule, La Salle and others' travels are described, with Etienne Brule said to be the first European to use it (other reports state that he portaged to the Grand and Lake Erie). It seems Governor Simcoe was greatly displeased with the muddiness of the portage, maybe due to one end being at Holland marsh before it was drained and made drier. His trip was made in the fall when water could have been low with description of the guides having to step out into very deep muck and pull the canoes through. On the return he used a more easterly portage (but the route along the Rouge river isn't identified). After these difficulties, Simcoe had the road built from York to Holland landing, Yonge street. Also some very interesting details on the Huron-Iroquois wars which ended in the elimination of Huronia... the Iroquois likely used the Toronto portage, moving north, taking prisoners and burning villages until they arrived at Midland on Georgian Bay. 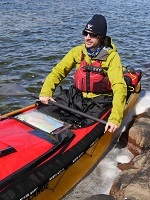 A description of the Toronto portage includes that it took two days to drag the canoes through mud at the north end, going through Holland marsh. Several descriptions of fine stands of pine trees on the Oak Ridges moraine, maybe a reason it was also called the Great Pine Ridge. And the Humber had to be crossed several times, if that affects the location of any waterfalls. Because of the muddy situation difficulties, Simcoe returned by another path along the Don river (not the Rouge as reported in other accounts), losing the way several times because this path was not as well-defined and eventually relying on a surveyor's cut line to find the way back to York (Toronto). The lack of food on the return was becoming desperate and the party was considering eating Simcoe's dog, Jack Snap. It's a pity that Simcoe's wife, Elizabeth, wasn't there to sketch and record the trip, instead there are numerous illustrations of Toronto and area. A canoeing detail... in those days, late 1700s, it was considered unthinkable for a lady from the upper classes to be seen paddling a canoe (Elizabeth Simcoe wrote that she admired how lovely the canoes were when paddled with skill by natives). Ladies stayed seated in the center while guides paddled... this applied to gentlemen as well, always seated in the center, not paddling. PS... Elizabeth Simcoe sometimes amused herself (John Graves was away much of the time worrying about an American invasion) by setting the forest on fire. This was often done by natives to increase food production.